After doing battle on the big screen in Alien Vs. Predator and Aliens Vs. 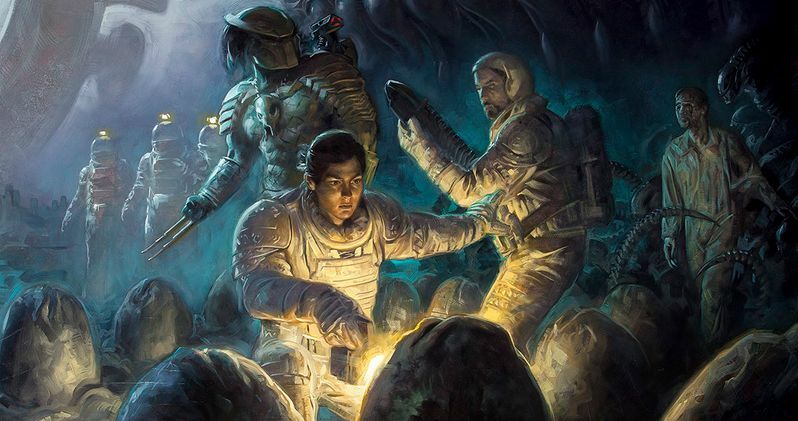 Predator - Requiem, the Alien and Predator franchises will clash in the pages of Dark Horse Comics' Prometheus: Fire and Stone, set after the events of Ridley Scott's Prometheus. Take a look at the trailer, along with the comic book artwork, then read on for more details on how this innovative comic book series is formatted. Prometheus: Fire and Stone follows a team of explorers who set off on a new mission to find out what happened to the original Prometheus team, since they never returned from their journey to LV-223 in the movie. This new team must uncover the dark mystery that holds not only the fate of the original mission, but possibly their own damnation. Prometheus: Fire and Stone will be the first in four separate comic series, along with Aliens: Fire and Stone, AVP: Fire and Stone and Predator: Fire and Stone. The books will be published on an eight-week cycle, with a new issue in one of the four books being released every two weeks. All four series' share some of the same concepts, characters and situations, with the overall story arc set to be wrapped up in one special issue after each of the four books have concluded. Paul Tobin, who helped create Prometheus: Fire and Stone, had this to say in a statement. "We've done a lot of things to work [these franchises] together, and I think watching how they link... that's been an amazing thing for me to be a part of, and I think the readers will really respond to that." Take a look all of the covers for these comics below. Prometheus: Fire and Stone will be released in comic book stores and on digital formats September 10, with Aliens: Fire and Stone debuting two weeks later.